Register to be kept up to date with our congress newsletters. To be notified of the latest congress information, please complete an expression of interest form. 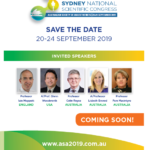 Congress e-blasts will be posted here so you can stay up-to-date on ASA NSC 2019. Download the official Congress flyer and distribute to your colleagues and friends.